Eeeny Meeny is a page-turning thriller that kept me on the edge of my seat and often made me cringe with disgust and disbelief. The story starts out with a man and a woman trapped in an empty, abandoned swimming pool. They have no recollection of how they got there. The last thing they remember is accepting a ride and hot coffee from a stranger on a cold, rainy night. Soon after realizing they are trapped, they find out that the only way to survive is to kill. One lives. One dies. That’s the game. Eeny Meeny. I was hooked! Enter Detective Helen Grace, who is tasked with finding the person responsible for the “eeny meeny” kidnappings. She’s tough, intelligent and independent and has a closet full of skeletons (a few that might even have something to do with the case). Oftentimes, detectives in crime/thriller novels do things that make you think: “Hmm. That was kinda dumb.” Not the case with Detective Grace. She’s no-nonsense and now one of my favorite female protagonists. The only problem I had with this book is that it did not contain section breaks, which hindered the flow of the story. I had to reread several parts where breaks should have been in order to figure out whose thoughts I was reading or where the scene change occurred. Regardless, the premise is so intriguing and the plot points fit so snuggly together like the pieces of a puzzle that the lack of breaks did not affect my overall enjoyment of the story. Since I received my copy from NetGalley, I assume there must be section breaks in purchased copies. If not, then keep reading even if the lack of breaks bothers you. This book is worth finishing! 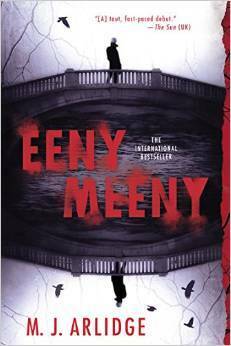 If you like suspense thrillers with multiple twists and turns, I highly recommend Eeny Meeny. It is simply brilliant, and I look forward to reading the rest of the books in this series. Lovely review. I had the same problem with the page breaks. I don’t like to have to go back and re-read to find out who is talking or what not. But I was able to look past them and enjoy the story. It reminded me of Saw in a way.